We’ve talked about Uncharted 4's single player a lot. It’s time to discuss the game’s multiplayer. We like it, respect it but don’t quite love it. Patrick, Jason and I chatted about it earlier today. We’ll go first, but I’d also love to hear from those of you who’ve been playing it down in the comments. Stephen Totilo: Guys, I’m guessing we’re all on the same page here. We don’t play the Uncharted games for the multiplayer, right? Yet here we are with Uncharted 4, a huge PS4 release, a game we all wanted to play, and it doesn’t just have multiplayer but about a year’s worth of planned additions to the multiplayer. I’ve now had the game for a few weeks and have played a few hours of multiplayer. I’ve got some thoughts about it. But I’m curious: did either of you care much about Uncharted 4's multiplayer before the game came out? Were you looking forward to playing that part of the game? Jason Schreier: Nope. I had heard that The Last of Us’s multiplayer was really really good, but I never bothered with that either. In general I’m not a big fan of third-person shooting in multiplayer. Patrick Klepek: I had hopes for Uncharted 4's multiplayer, after really digging that component of The Last of Us. In that one, it was slow, methodical, and brutal. It felt like a natural extension of the single player game. I suppose that’s true of Uncharted 4, as well, but the hump I’ve never been able to get over, one that’s dogged the series for me since day one, is how the combat plays. It’s never stuck–it feels too loose. That’s rough enough in the single player, and even rougher in multiplayer. Stephen: Yeah, Patrick, the relationship between the single and multi in this game is weird. We’ve got a series that started solo only and added multiplayer later. Same as Assassin’s Creed, though Ubisoft really tried to make something thematically consistent by designing a distinct multiplayer experience that was based on the same acrobatic stealth and deception integral to the solo game. 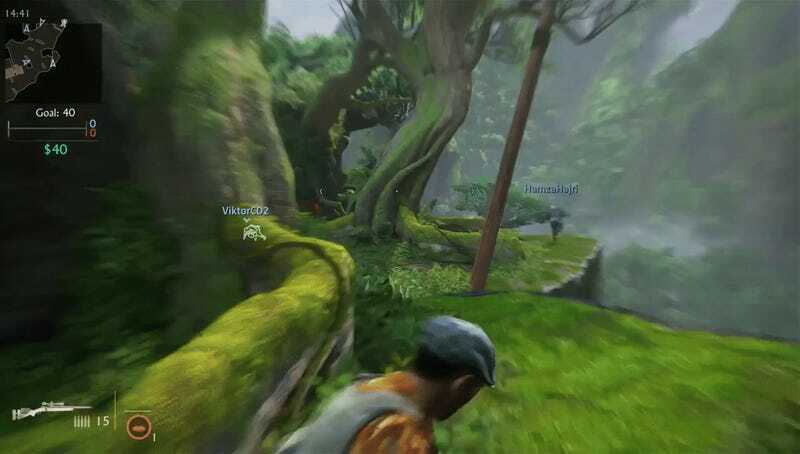 For Uncharted, I guess it’s a natural extension of a third-person shooter to have multiplayer third-person shooting. And Uncharted 4's multi puts the new rope-swinging mechanics to good use, which makes the single player’s traversal gameplay feel like it has a presence in multiplayer. But I find it weird to play a heavily story-driven solo game and then just use that cast of characters as avatars in a shooter. It’s not a bad thing, just an odd fit. Maybe that’s just because I didn’t play enough Gears of War or other games that do the same. Patrick: I will say the rope mechanic, which was my favorite addition to combat in the single player game, is terrific in multiplayer. It adds a wonderfully dynamic element to getting around. What can be frustrating about the loose controls in Uncharted is that I never feel...in control. The rope feels good to whip around in, and lets you achieve a verticality in play that makes the combat way more fun. You can do a lot more. Jason: Do you guys think it’s weird that you can use the rope as a melee attack in multiplayer but not in single-player? I wonder why Nathan doesn’t know how to do that in the normal game. Stephen: Nah. Didn’t bother me. I mean, he can’t summon AI buddies or mystical artifacts in the main game either! Patrick: Gosh, I wish he could, too. The single player game desperately missed more options for stealth/melee combat. Stephen: Patrick, I’m thinking the loose controls are helping me out, because, wow, I actually don’t immediately get murdered when I play Uncharted 4 multiplayer, as I do when I casually dip into other multiplayer shooters. Maybe everyone is at a disadvantage! Patrick: I don’t think that’s true, but I do think Uncharted is an easier entry point into multiplayer shooters. I think it’s deliberately calibrated to be easier to jump into as a casual or new player; some of the power-ups you get access to–like the mystical artifact that spews angry spirits–allow you to contribute without being great at head shots. Stephen: Yeah. It definitely seems easier to get into. I love the Trials system, which I’m not used to seeing in multiplayer games. That’s the pile of solo missions set against AI bots that challenge you to do the basics of multiplayer. Get grenade kills, summon sniper AIs, etc. Naughty Dog appears to be committed to making it easy to learn how to play their multiplayer game without throwing you into the deep end. Patrick: Most games presume the single player is a tutorial for the multiplayer, while Uncharted 4 remembers that it’s actually a pretty different game. Patrick: All of that is incredibly smart. Multiplayer has gained a reputation for only being for “experts,” inaccessible to someone who just wants to jump in and have fun. Part of the reason is because the advanced mechanics are buried under years of assumed learning. Uncharted 4 tries some deprogramming with the trials, allowing you to get a feel for what you “should” be doing in a multiplayer match, besides running around and shooting. Most games presume the single player is a tutorial for the multiplayer, while Uncharted 4 remembers that it’s actually a pretty different game. Jason: So is Uncharted 4 an esport? Stephen: No idea, but I’m sure Sony would be happy for it to be. Every company wants their shooters to be esports now. Because I’m not a huge multiplayer gamer, I don’t have a sense of what’s a good amount of value or content at launch. Uncharted 4 has just three main modes: team deathmatch, command (hold control areas to earn points) and plunder (carry an idol to a treasure chest). I don’t think it has a ton of maps, but it does have a ton of unlockable characters and cosmetics that you can choose to pay for. Does it seem like enough? Too skimpy? Jason: I’m with you there, Patrick. I have absolutely zero interest in continuing to play Uncharted 4's multiplayer (there are so many other multiplayer games to spend time with) but I appreciate that it exists, and that it’s solid enough for the people who will treat it as their One Big Game for the next year and then some. Considering it’s just a supplement to one of the year’s strongest single-player campaigns, that feels like great value to me. Jason: I have absolutely zero interest in continuing to play Uncharted 4's multiplayer (there are so many other multiplayer games to spend time with) but I appreciate that it exists, and that it’s solid enough for the people who will treat it as their One Big Game for the next year and then some. Stephen: Do you care about the cosmetics? My characters look really vanilla now aside from their fancy hats. I like some of the gear I see on other people, but I also have very little desire to unlock more. I wonder if that’s because I like but don’t love Uncharted 4 multiplayer or if it’s the aesthetic. I’m similarly unmotivated by the gear in the very differently structured but also very grounded real-world Division, whereas I feel more gear envy and loot lust with something exotic like Destiny or Diablo. Patrick: I’m ambivalent on the cosmetics, but this game has some really good emotes. They rival Destiny’s. Jason: Gear is a lot more interesting in sci/fi or fantasy worlds. I got a Taken helmet for my Destiny character and it’s super badass, not gonna lie. Stephen: True, Patrick. The emotes in this game are pretty amazing. Patrick: Overwatch, in which only cosmetics are hidden behind the progression system, has soured me on how Uncharted and many other games handle unlocks. Just give me access to everything, and let me figure out what I want to do. Stephen: And I guess Overwatch is a real factor here. Hell, any other multiplayer game drawing people’s attention is. Stephen: The multiplayer feels solid. I’m a little more cynical about the balance of unlockables than you guys are. The dual-currency thing and the pace of unlocks does feel engineered to push people toward additional spending. Nevertheless, the gameplay is good and I’m interested to see how the one year plan develops. Of all things, I find myself wishing I had a download copy of the game instead of a disc, because I could see myself playing a couple of rounds of multiplayer as an appetizer or dessert for other games I’m playing, but it doesn’t compel me enough to make me always want to have the Uncharted 4 disc in my PS4's drive. Looking at the road map they have for it, do you see anything that’ll draw you in? Jason: “The first-ever single-player story add-on for the Uncharted series” - sold! Stephen: Ahh, Jason, we should at least play the co-op! A plunder match-winning move by stotil! Jason: To one of your earlier points Stephen, I do think there’s kind of a weird and interesting dissonance to the idea that Nathan and a bunch of his friends/frenemies are all just shooting at each other in the jungle for no reason. It makes for a funny contrast to the single-player campaign, which is this big hefty swing at telling a story that feels human and resonates with audiences in an emotional, realistic way. They even got rid of all the supernatural nonsense from past games! Yet when you exit out from Drake and Elena eating noodles and move the menu cursor down a slot, you’re suddenly summoning magical totems and firing bullets at clones of your friends. It’s amusing. Stephen: Just when Naughty Dog has solved one ludonarrative dissonance problem, they create a new one! As I think I said in my review, I’m kind of thinking of Uncharted 4 multiplayer as the post-credits dance number that the cast all join in on. Anyway... We’ve dabbled with Uncharted 4 multiplayer. We respect it. We may not have the time for it, but, I think we’re happy Naughty Dog made it. Sure doesn’t seem like it hurt the quality of the campaign. I’d love to hear from our readers who’ve been playing Uncharted 4 multiplayer. What do you all think of it?